A reader sent me a link last week to a pretty incredible article in the Maxwell/Gunter Dispatch reporting that Professor George Stein, the Director of the Cyberspace and Information Operations Study Center at the Air Force’s Air War College (“The Intellectual and Leadership Center of the Air Force”) told people attending a seminar on security issues and emerging technology that it was okay to spy on avatars because “the Supreme Court has ruled that avatars are not real people” and that avatars are, thus, “not governed by laws.” The article does not identify any ruling by name. One seminar attendee offered this takeaway: “What interested me very much was the issue of privacy on the spaces, and how the law doesn’t apply to cyberspace.” As a guy who recently wrote several hundred pages about how the law does apply to these spaces, that very much interested me too. I’m skeptical, but I would love to know what decision Professor Stein might have been talking about, and how he’s interpreting it. I haven’t had any luck with my usual research tricks, so I thought I’d run a contest in the comments. Help me out, and you could get a signed copy of my book, Virtual Law. Case analysis gets you the best shot at the book, but polemics, historical analysis, and jokes about spending tax dollars bugging Luskwood are worth points too. I expect readers will either find this mystery case or do a solid job debunking the claim. Either way, in two weeks I’ll pick the best comment and send the winner a signed copy of Virtual Law. Pass this one on to your constitutional law friends who don’t follow virtual worlds too, if you wouldn’t mind. I’d really like to cast a wide net here, since that’s the fastest way to get to the bottom of this claim. Artist and “SLART” trademark-registrant Richard Minsky recently filed a letter brief (.zip, with exhibits) alleging that Linden Lab has failed to comply with a Temporary Restraining Order covering claims of use of “SLART” in Second Life. Linden Lab responded (.zip, with exhibits). The court has not yet ruled. For the full background of this case, see VB’s ongoing coverage of the SLART trademark lawsuit. In brief, Minsky is suing Linden Lab, Second Life user ‘Victor Vezina,’ and past and present Chairmen of Linden Lab’s Board of Directors Mitch Kapor and Philip Rosedale over use of Minsky’s registered trademark “SLART” in Second Life. Minsky is representing himself. In the letter brief, Minsky refers the court to an email he sent to Linden Lab (.pdf) in September stating that Second Life user ‘Tate Watanabe’ was infringing Minsky’s SLART trademark via an object called “SLart Show Viewer” in Second Life. 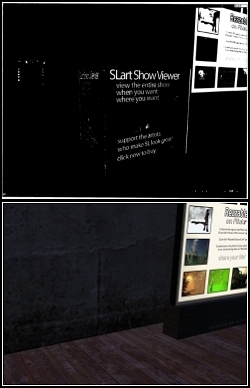 The object, according to Minsky, could be found at Rezzable’s Cannery (SLURL). The dispute over this object is likely to attract a fair bit of attention, as Rezzable is one of Second Life’s best-known content creation companies, responsible for the popular Greenies build, among others. Linden Lab refused to transmit the order to ‘Watanabe.’ Linden Lab’s emailed response (.pdf) to Minsky states that “Linden Lab did not locate this use either in the Second Life region ‘Cannery Rezzable’ … or after searching for the use under the ‘All’ search tab of Second Life search.” The allegedly infringing object is not currently there (see image right, bottom). Minsky’s letter brief attacks both of these arguments, and Linden Lab responds. Excerpts from both parties’ arguments follow. Virtual law news is finally trickling out of China following the Olympic media storm. The9 is touting another victory in its ongoing war against plugins. The9, which operates World of Warcraft for our Chinese friends, has won a lawsuit against a gamer found to be using a plugin for its licensed MMORPG World of Warcraft (WoW). The9 has been waging an ongoing war against plugins. The company introduced anti-plugin software in 2004, which it claimed was able to stop plugins completely. Apparently, the software didn’t solve their problems, prompting a March 3, 2007, announcement that Chinese World of Warcraft game accounts found to be using plugins would be permanently closed. The gamer involved in this litigation was discovered to be using a plugin on September 9, 2007 and his game account was swiftly suspended on September 10, 2007. A plugin (or “addin”, “addon”) is a computer program which resides on the user’s computer that interacts with a host application (a web browser or virtual world interface, for example) to provide extra functionality. Game plugins like those associated with World of Warcraft improve gameplay by intercepting and recomposing the data sent to game servers from games. Hundreds, if not thousands, of plugins exist for the U.S. version of World in Warcraft. Of course, choosing whether to use a plugin is left to the discretion of the gamer. Many gamers swear by the increased functionality provided by plugins…after all, only n00bs would use the user interface provided by the software. Not much more is known about this case other than the facts stated above so we can’t go much farther with the legal analysis. The case was heard by Shanghai No. 1 Intermediate People’s Court. China’s Intermediate courts are the second lowest local people’s court. They handle not only appeal cases from the basic people’s courts but also handle relevant important local cases in the first instance. It’s not clear whether this case came up on appeal or whether it was considered an “important” case. I have a better solution for dealing with the people who use plugins…just put them on their own server! Let them use plugins but cut them off from the remainder of the WoW population. No more arguments that plugins cause an unfair advantage…just stop playing on a “plugin” server. The9 keeps its paying subscribers and saves money on litigation. There could be some security concern on The9′s part which I’m not privy to, but the U.S. seems to have it figured out, so I don’t know what the problem might be. Second Life creator Linden Lab’s attempt to open a second front in the battle over SLART has been stymied. The USPTO Trademark Trial and Appeal Board suspended (.pdf) the cancellation proceeding that Linden Lab initaited last month regarding artist Richard Minsky’s registration of “SLART” pending the outcome of the lawsuit Minsky filed earlier in Federal court against an avatar named as an individual alleged infringer, Linden Lab, and Linden Lab executives. Minsky asked the Trademark Trial and Appeal Board for the suspension and Linden Lab opposed it. The suspension was granted following a telephone conference.